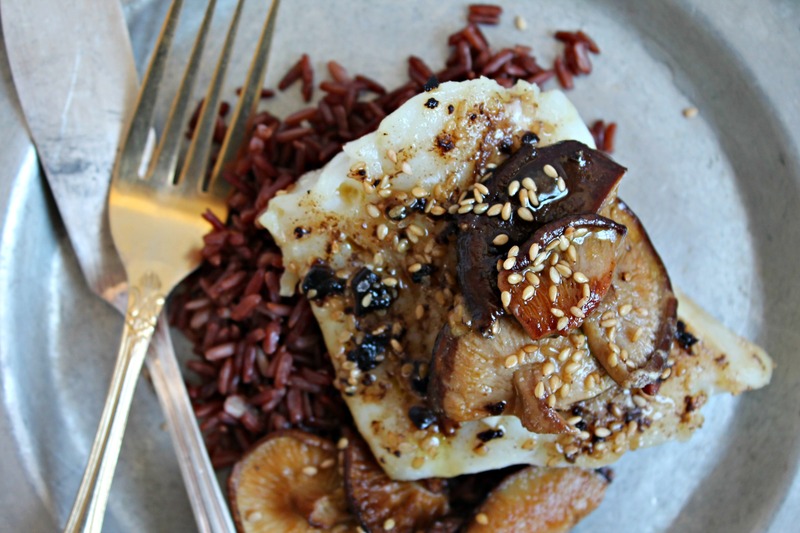 This Black Garlic, Sesame, & Shiitake Cod is roasted to perfection from frozen in 14 minutes. Great dinner idea for Lent Fridays when you’re craving something other than the regular fish fry. Inspired by the Alaska Seafood’s latest e-book, Frozen to Fork…No Need to Thaw, gorgeously photographed by Aran Goyoaga of Cannelle et Vanille, I created this recipe for Black Garlic, Sesame, & Shiitake Cod thanks to the generosity of the folks over at Alaska Seafood who sent me frozen (but fresh!) Alaskan Cod for me to test out. Cod is such a New England staple and one that my husband and I always order when we’re out at restaurants (well, it’s always a choice between if there are scallops or cod on the menu; cod usually wins). The way it’s presented on menus is always so alluring, so enticing. As a protein, cod is a blank canvas for chefs to make their mark on. It’s gorgeously delicious whether it’s simply seared in butter and seasoned with salt, or a more lavish preparation with 20 steps. Why eat frozen fish from Alaska? Responsibly harvested from cold Alaska clean waters, wild Alaska seafood is rich in vitamins, nutrients, and heart healthy Omega-3s! Thanks to innovations in processing, the freshness of wild Alaska seafood is captured right at sea and goes straight to us. Think individual frozen fillets of delicious salmon, halibut, cod, pollock, and more, all readily available in the frozen section at your local market. You might be thinking that this Black Garlic, Sesame, & Shiitake Cod is a fancy dish, but it honestly comes together super quick! Wondering where to get black garlic? Your local Trader Joe’s carries it! I wouldn’t recommend substituting black garlic with regular garlic, as the regular garlic is to pungent and not as soft. Black garlic is soft and sweet due to the fermentation process it’s been through. Don’t let the color scare you, it adds a slight sweet but toned-down garlic flavor that makes this dish! And if you love it so much, you can buy a pound of black garlic on Amazon. Packed with flavor, these roasted cod filets will become your go to method to cook frozen fish! Rinse frozen fish, pat dry with a paper towel, and place on non-stick pan. In a small bowl, place black garlic and warm in the microwave for 10 seconds. Mash the garlic clove and add olive oil and sesame seeds. Brush this mixture on frozen filets and sprinkle the mushrooms around the fish. Place in oven for 12-15 minutes, depending on the thickness of the fish. If your filets are on the thick side, flip halfway through cooking. Serve alongside rice, your favorite salad, or whole grain! COOK IT FROZEN!® techniques shared by Alaska Seafood. Disclaimer: Alaska Seafood sent me gorgeous cod free of charge, but I was under no obligation to write about it. I did so because this recipe was too good to not share with everyone! steaks..I will give it a try…. Fantastic use of Black Garlic, I’ve got to try this, beautiful! I love this recipe, especially the garlic! The deep sweet flavor of the black garlic is my favorite. I’m always looking for new ways to cook fish. This looks so delicious…I love all your ingredients!